Thanks to Don the Beachcomber, Trader Vic, and other purveyors of faux-Polynesian pop culture, tiki bars and restaurants were hugely popular in midcentury America. The fad was inspired by the Pacific islanders that U.S. G.I.s encountered during World War II and later read about in James Michener books like Tales of the South Pacific and Hawaii. Though the tiki craze began in California, Hawaii was soon swept up in the frenzy. Ernest Gantt, aka “Don the Beachcomber,” opened his first Honolulu restaurant in 1946. A decade later, he founded the International Market Place in Waikiki. The Market Place was a tikiphile’s paradise, brimming with fish ponds, waterfalls, and artisans fashioning tiki from native wood. Don had a restaurant there, of course, and a treehouse office, high in the limbs of a gnarled banyan. The International Market Place was demolished in 2014 and replaced by an upscale shopping mall. 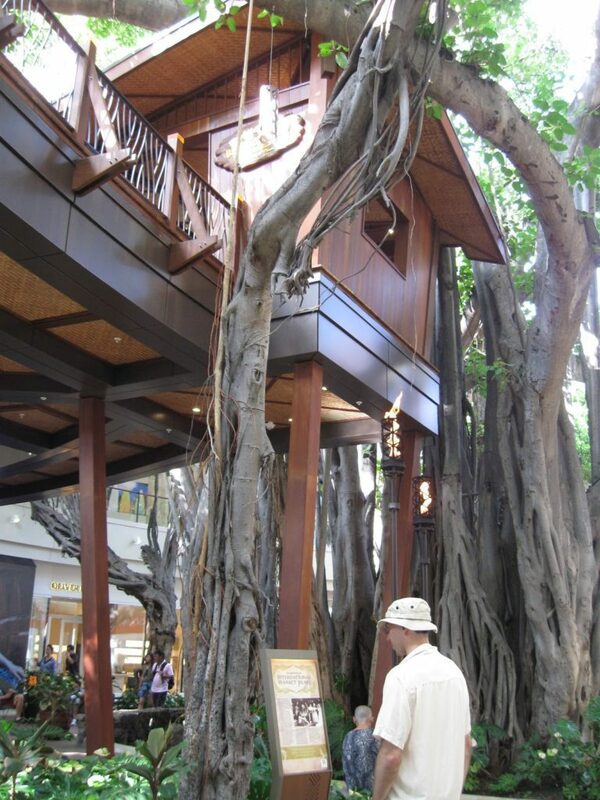 Fortunately, the old banyan is still there, complete with a replica of Don’s treehouse. Inside, you’ll find historical displays with photos of Don and his famous guests. It makes a nice perch to listen to the Hawaiian bands that perform below. The only remaining vintage tiki establishment on Oahu can be found on the shores of Honolulu’s Keehi Lagoon. La Mariana Sailing Club was founded in 1957 and has become a museum for castoff treasures from long-lost tiki temples like the Sheraton Waikiki’s Kon Tiki Room. 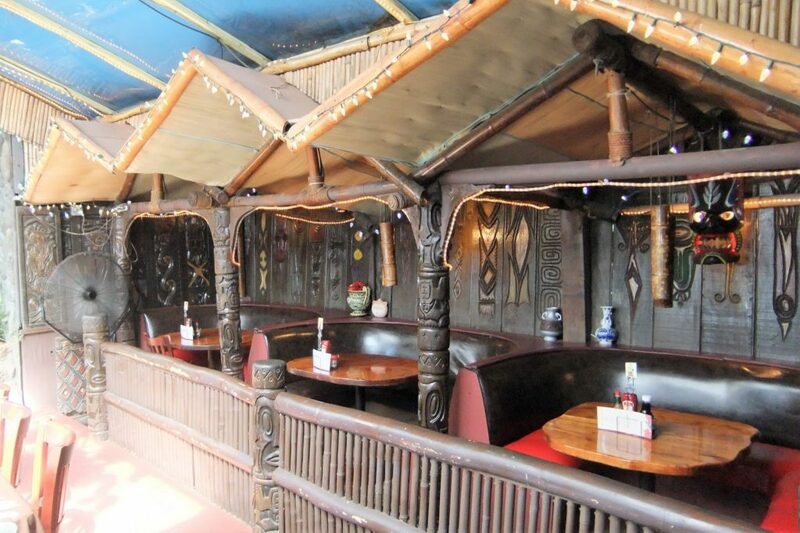 In La Mariana, you’ll find the Kon Tiki’s carved totems, Trader Vic’s lamps, and Don the Beachcomber’s koa wood tables. Grab a Rum Punch and wander around. There’s something to see on every inch of wall. 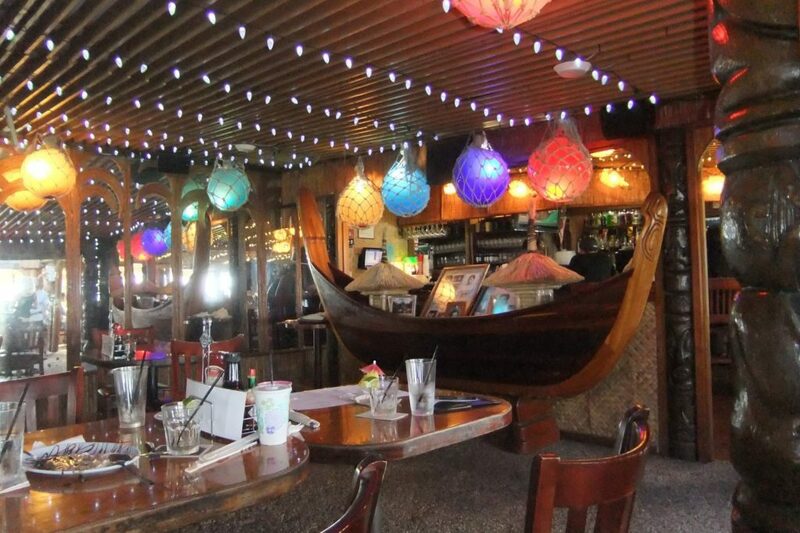 The restaurant serves tiki-licious food (try the Hawaiian Cajun Ahi) and the bar, with its pufferfish lights and live local music, is legendary. Tiki’s Grill and Bar opened in 2002 on the second floor of the Aston Waikiki Beach Hotel. Though the décor features plenty of tiki staples (glass floats, Polynesian masks, lava stone), it does more than ape the classics. 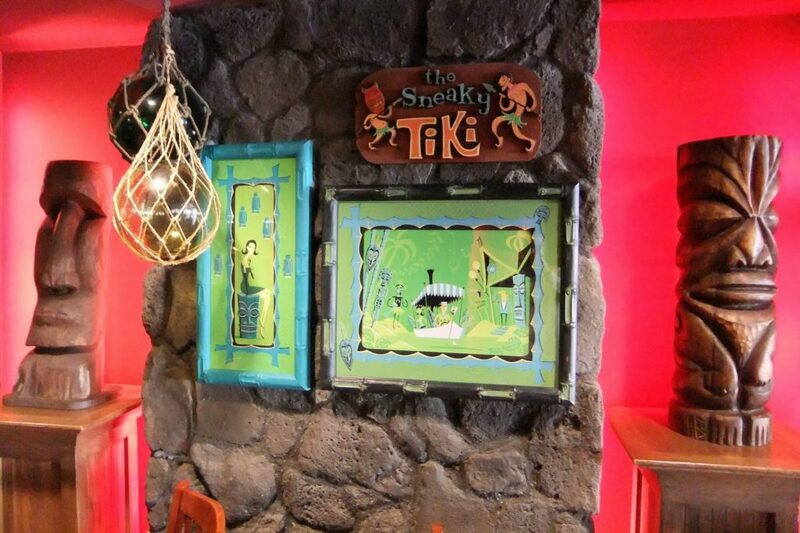 The retro tiki art of Shag is featured throughout the dining room, giving it a playful hipster vibe. The tiki mugs are similarly whimsical and quite affordable. Great mugs by Sebastian can be had for as little as $4 plus the price of a drink. The food, by Chef Ronnie Nasuti, is fantastic, if a bit pricey. I loved the soft-shell crab slider on a purple taro bun, which came with a side of kimchee. There are a number of smaller tiki bars around Waikiki waiting to be discovered. Places like Arnold’s and Da Big Kahuna aren’t historic, but they’re friendly, affordable places to throw back a Blue Hawaii or two. It’s also fun to just walk the streets, hunting down old tiki that might once have graced the entrance of an exotic lounge. You never know what you might find behind an overgrown hedge in Waikiki. 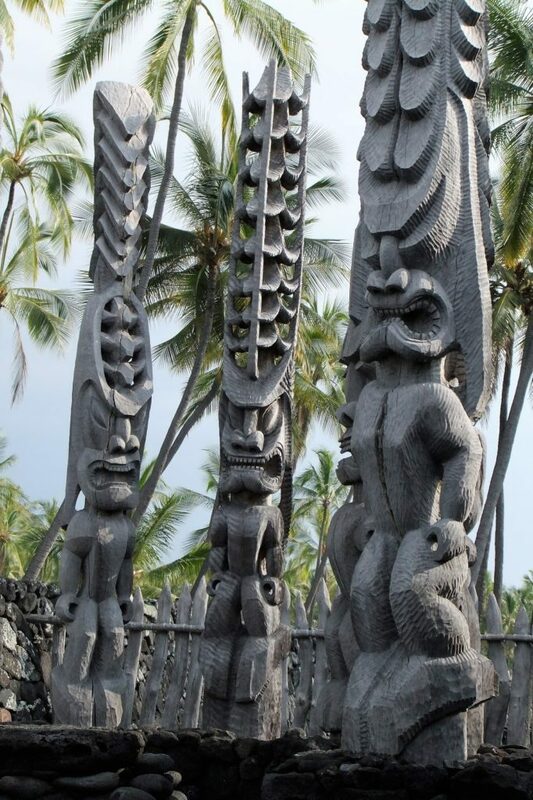 In Hawaii, wood or stone carvings are actually referred to as ki’i, not tiki. 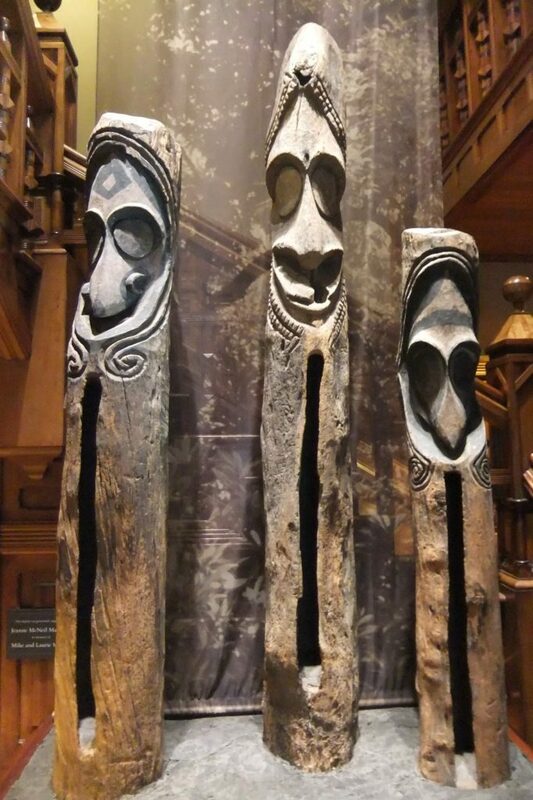 One of the best places to see authentic examples of this native art is at Honolulu’s Bishop Museum. 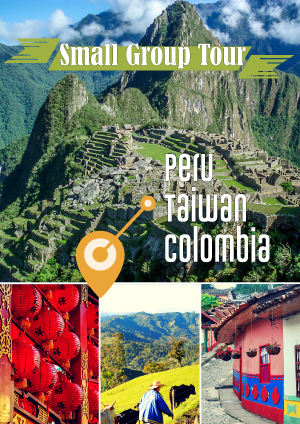 The extensive collection includes artifacts from across the Pacific—everything from wooden fishhooks to poi pounders and calabash bowls. Due to their rarity (most were destroyed after the Hawaiian people converted to Christianity), the antique ki’i are a particular highlight. If you want to see ki’i in their true, pre-Christian context, head to the Big Island of Hawaii. 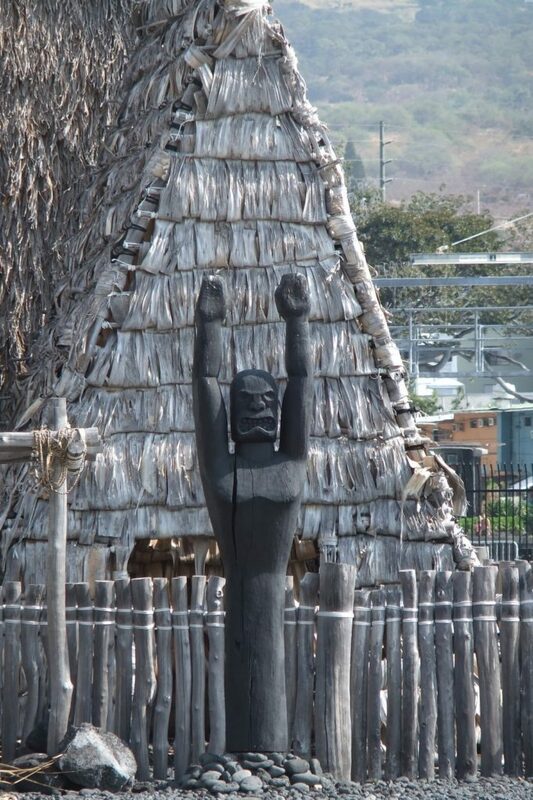 Native temples, or heiau, with ki’i can be seen at Pu’uhonua O Honaunau National Park and the Ahu’ena Heiau in Kailua-Kona. The recreated ki’i at these sites are based on sketches from the early 1800s. It’s kapu, or forbidden, to enter the temples, but the wonderfully carved guardian images are easily observed from outside. Return to the world of tiki pop at Don the Beachcomber in Kailua-Kona. While not an original Don the Beachcomber (none remain), this 2005 revival features an enormous Easter Island-style Moai and torch-lit views of the rocky Kona coast. Don’s Mai Tai Bar is the place to be for happy hour. There are many versions of the classic cocktail available. If you can’t decide, try a flight of mini tasters. The Zombie is great, too. But beware. As if this deadly drink wasn’t strong enough, Don’s adds absinthe. You can find hand-carved tiki figures and masks at various outdoor markets (Duke’s Marketplace in Waikiki, Kona Farmers and Crafts Market in Kailua-Kona), but a more adventurous option is to take a drive out the sunbaked Mamalahoa Highway on the Big Island to the Ka’u Outpost. 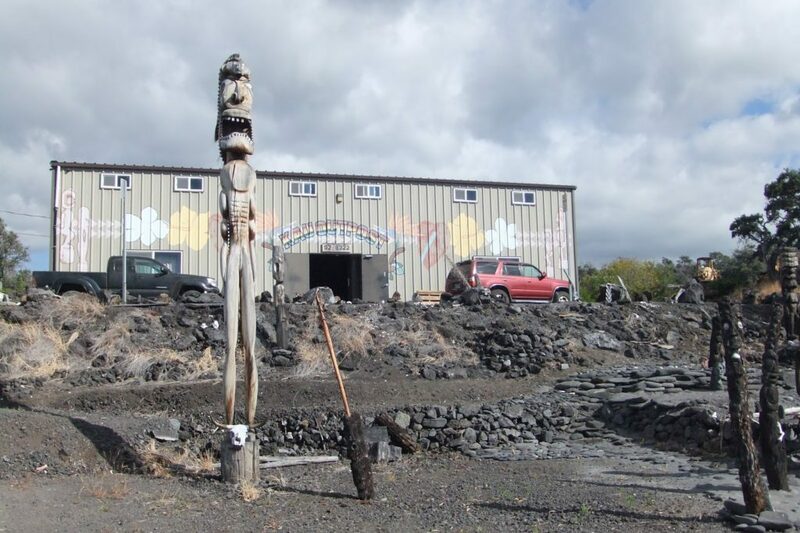 Set amidst a barren landscape of old lava flows, the outpost houses the workshop of artist Danny Freeman. In addition to tiki (many of which decorate the property), you can buy luau platters, pig boards, and custom furniture. In Kailua-Kona (Big Island) it’s hard to beat the Royal Kona Resort. 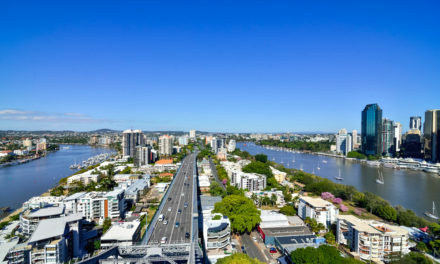 Don the Beachcomber is located here. 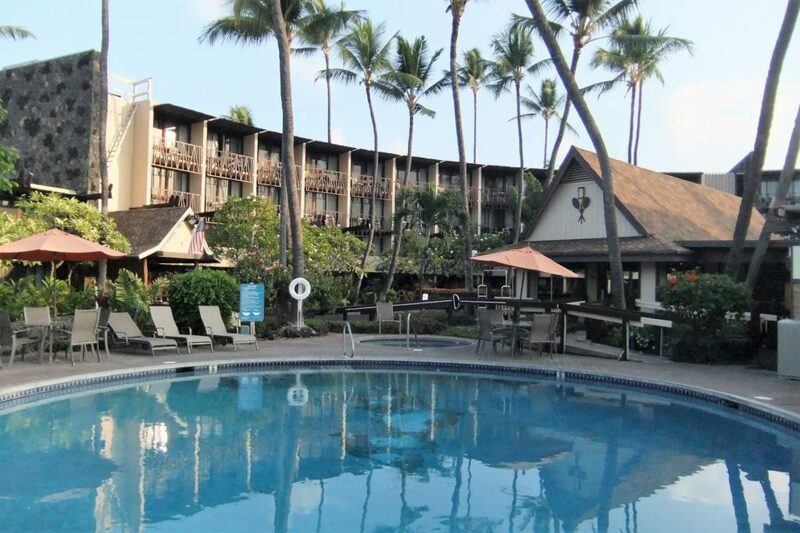 If you crave a more authentic ambiance, there’s the Courtyard King Kamehameha’s Kona Beach Hotel. The Ahu’ena Heiau, where King Kamehameha I died, is next to the beach, and the lobby is full of fascinating artifacts, including an outrigger canoe. On the cheaper end of the spectrum is Uncle Billy’s Kona Bay Hotel. It was built in the 1950s as the Mauna Loa Wing of the historic Kona Inn, and still retains that classic midcentury modern tiki look. 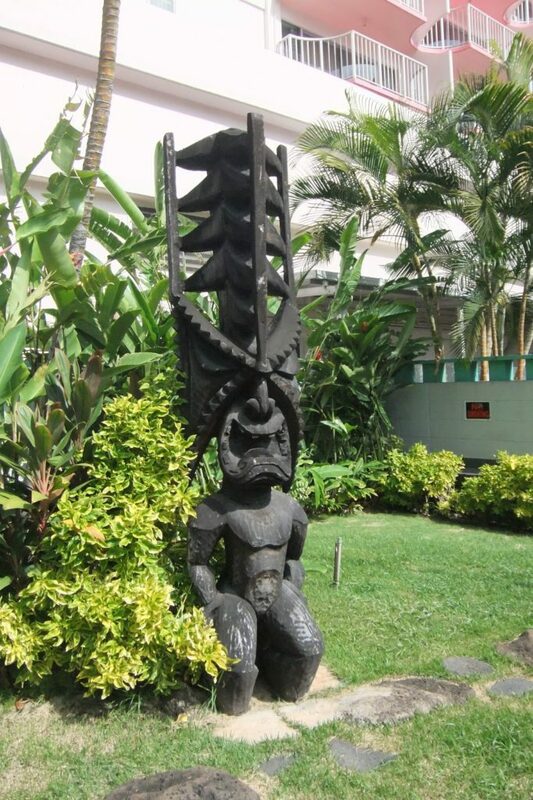 In Waikiki (Oahu), the Hilton Hawaiian Village packs a lot of tiki history into its sprawling, multi-tower property. 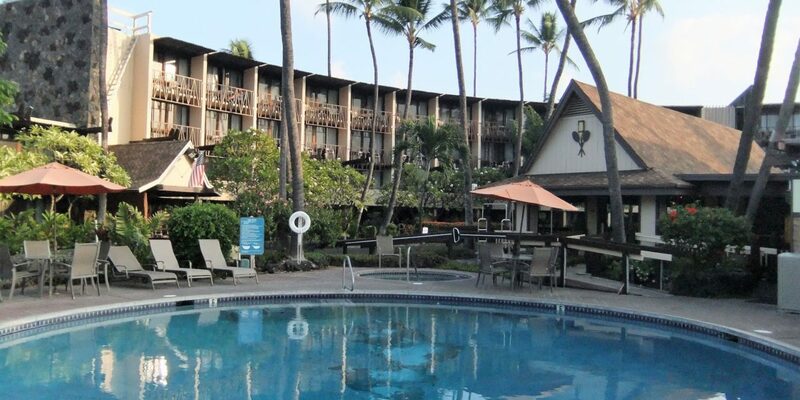 This was Elvis Presley’s favorite hotel, and scenes from his hit movie Blue Hawaii were filmed here. 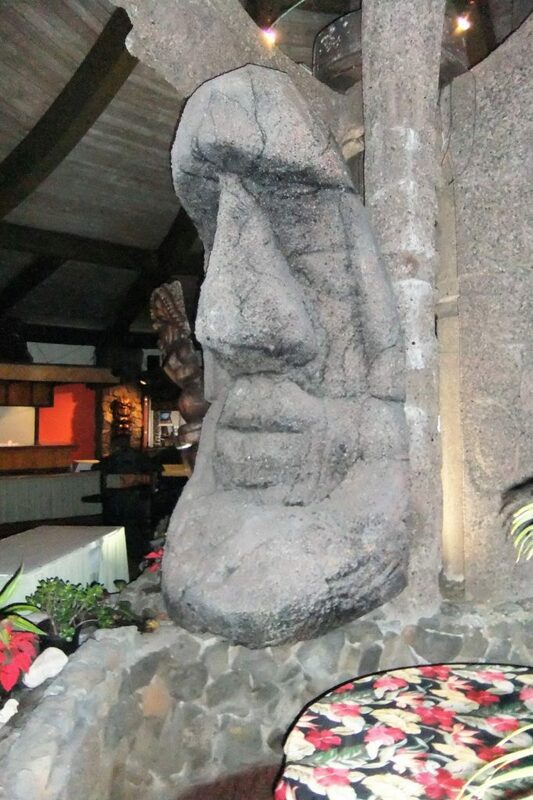 The Aston Waikiki Beach is home to Tiki’s Grill and Bar and has some cool surf-themed décor as well. 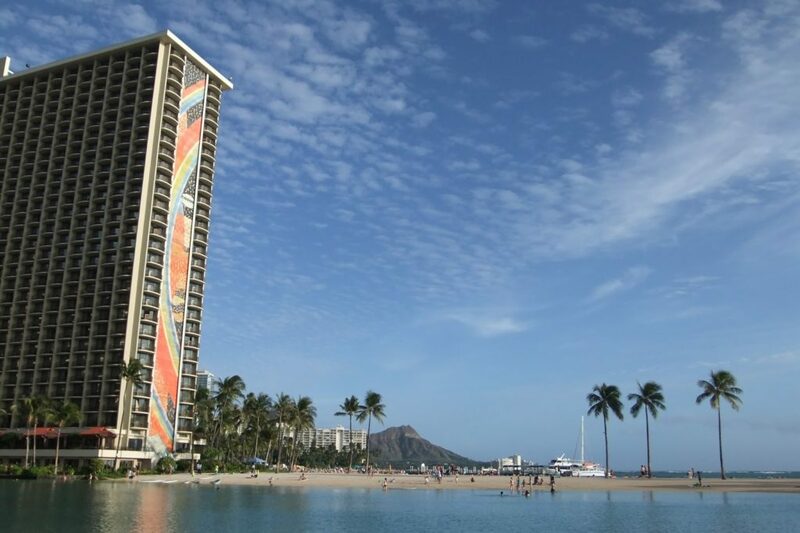 The Outrigger Waikiki Beach Resort features two oceanside tiki retreats: Duke’s and the Hula Grill.